Explanation: Have you ever watched a lightning storm in awe? Join the crowd. Oddly, nobody knows exactly how lightning is produced. What is known is that charges slowly separate in some clouds causing rapid electrical discharges (lightning), but how electrical charges get separated in clouds remains a topic of much research. Lightning usually takes a jagged course, rapidly heating a thin column of air to about three times the surface temperature of the Sun. The resulting shock wave starts supersonically and decays into the loud sound known as thunder. Lightning bolts are common in clouds during rainstorms, and on average 44 lightning bolts occur on the Earth every second. 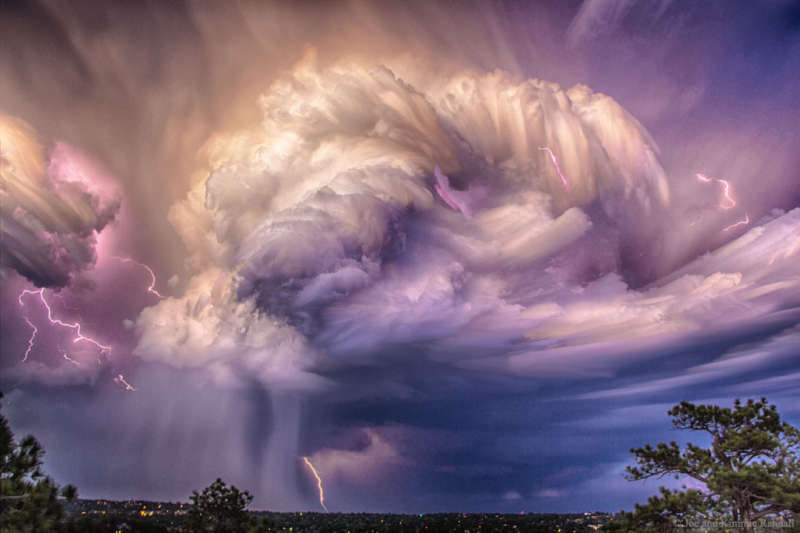 Pictured, over 60 images were stacked to capture the flow of lightning-producing storm clouds in July over Colorado Springs, Colorado, USA.